A few days ago, my Mom emailed me a YouTube link and followed up with a few phone calls making me *swear* to watch the video asap. Never one who loves forwards or viral stuff, I kind of “forgot” to be a good daughter and listen until today. I have to admit, what I saw during this 7 minute clip drove me to some pretty serious tears–I was blown away by the talent, courage and humilty of this 47 year old woman, whose dream it was to sing in front of a big audience. I promise, if you watch this clip, you will not regret the time spent doing it. Susan Boyle’s performance on Britain’s Got Talent is a reminder to all of us that you’re never too old to realize your potential, and to make good on all of the great ambitions you’ve ever had in your life. Rock on, Lost Lady! 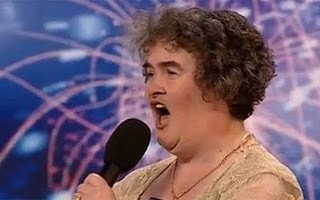 This Susan Boyle audition still brings tears to my eyes…I’m glad you posted it. Congratulations to this nice lady. I can’t wait to see how she does when the actual competition begins!